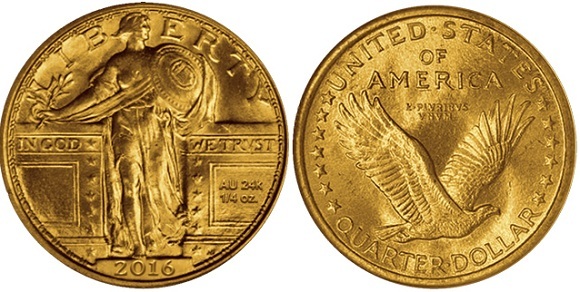 Professional Coin Grading Service (PCGS) announced today that it is developing a full suite of attractive labels for 2016 coins commemorating classic designs by the U.S. Mint, featuring .9999 24-karat gold coins in the original size of the Winged Liberty dime, Standing Liberty quarter dollar, and Walking Liberty half dollar. The Winged Liberty dime, designed by Adolph A. Weinman, includes an image of Liberty that often is mistaken for the Mercury, the Roman god, which is why the denomination is often called the Mercury dime. The gold issue of this coin will contain “AU,” symbol for gold, on the reverse. It will weigh 1/10 ounce. The Standing Liberty design, created by Herman A. MacNeil, also will contain the AU symbol and weigh ¼ ounce. 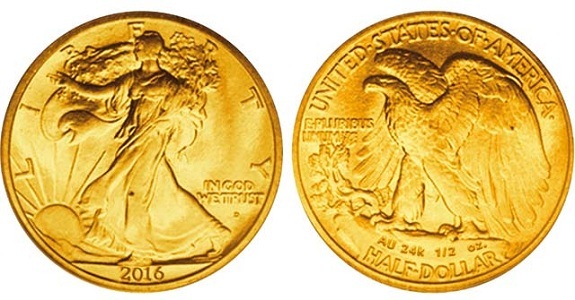 The Walking Liberty half dollar will contain the inscriptions AU, 24 K, and ½ ounce. The New Year will also mark two other important numismatic anniversaries, he added. “It will be the 30th anniversary of the American Silver Eagle bullion coins and the 30th anniversary for PCGS in 2016. Stephenson is correct about the appeal of these classic coins cast in pure gold. As a former member of the Citizen’s Coinage Advisory Committee, I can attest that several on the panel rallied for these commemoratives. My advice was to add the rarest mint marks to the 1916 series: the 1916-D for the dime (original mintage 264,000), the 1916-P for the quarter (52,000), and the 1916-S for the half dollar (508,000). But that involved complex manufacturing considerations involving government regulations for production at three mints and hence was scuttled. While several of the CCAC members praised the proposed new gold products when they were introduced to the panel, there also was some talk about the rationale of commemorating coins rather than people or occasions. That also was the case with the 2014 gold Kennedy coin, celebrating 50 years of the issue. 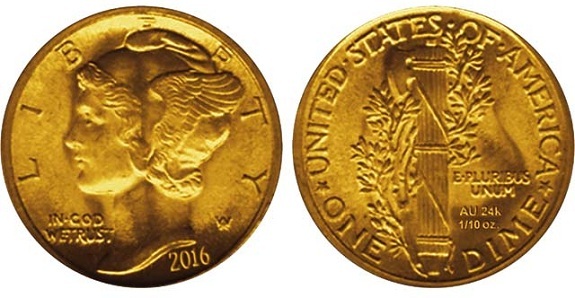 In the PCGS release, Stephenson said that “2016 is looking like it will be a bounce back year for modern coins.” I suppose there is plenty to criticize and praise about 2015 US Mint products, which also featured one of the most attractive modern coins ever minted, the $100 American Liberty High Relief Gold Issue. The obverse features a clean design by Justin Kunz (sculpted by Phebe Hemphill). The reverse eagle, designed by Paul C. Balin and sculpted by Don Everhart, rivals anything by Gobrecht or Saint Gaudens. Former CCAC Chairman Gary Marks was responsible for resurrecting this reverse design originally presented as a prospect for the 2015-W $5 U.S. Marshals 225th Anniversary Gold Coin. Marks also was an articulate spokesperson for the value of beautiful modern designs rather than continually celebrating the past. Let’s address that standard in association with the PCGS announcement about labels for the classic gold coins. First, our compliments to Mark Stephenson for being an advocate for coins and professional encapsulation that excites hobbyists. He knows customer relations as well as anyone in the country. We’re sure he will help select a series of labels that do justice to the classic gold coins mentioned in his release. Remember that hobbyists are interested in the coins. If the coins are masterpieces that will reinvigorate the modern coin market, as Stephenson predicts, let them shine, literally, with pure gold. It’s a shame the dime and quarter aren’t being struck in platinum because I think these two coins would look much better in that metal. Looking forward to all 3 of the thin bendable 2016 gold coins. I hope that the Mint will attempt to duplicate the finish and luster of the original coins, rather than the flat, lifeless surfaces of so many uncirculated modern commems. I was excited last year to hear that the Mint was going to do this. That wore off a bit when I noted that they will produce them in gold rather than silver. The average retail collector can’t afford to buy all three. I can see it now – the coins sell out within minutes, scooped up by dealers and flippers. Ebay will have listings posted on the day of the sale. The greed factor will win. Yes. Same thing happened with gold Kennedy. Message to the US Mint: Where are the affordable options for young collectors on a budget?? Everyone can’t afford to buy gold and platinum. Some of us have to settle for silver and clad options to grow our collections. It would have been nice to offer these coins minted in their original compositions, in addition to gold or maybe platinum. Will these golden birds be offered at the ANA Convention? Comeon lets have some fun. Busloads of fun. skeletor, I agree. They should do these in silver as well. As for collectors, to be able to buy these designs that will be “mint condition” is awesome for long time collectors. The “Mercury” dime should be awesome. I know, in gold, but at least it’s 1/10 of an once so it is in the price range of many. Thanks for this article Michael. Very interesting on the concept of using the classically rare 1916 mint marks. I think that would have been a real winner to do that! I’d like to hear about the “complex manufacturing considerations involving government regulations for production at three mints”. The US Mint could have most certainly accomplished this, but it would have required incredible competence in seeing it through, so based on the level of bureaucracy at any US division of government, I’m not surprised they “scuttled” that idea. I am curious though if these will all have the “W” mint mark placed in the historic mint mark location, and where that will be located on the half-dollar (i.e., on the obverse as in the 1916, or on the reverse as on the later issues)? 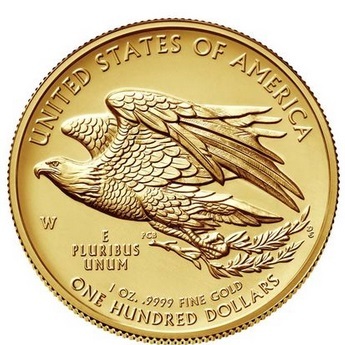 I would argue that the obverse of the $100 American Liberty High Relief Gold is not only a “clean design” (whatever you meant that to convey), but it also rivals Saint Gaudens’s double eagle obverse! By the way, I believe the Mint will release the silver medal version of these in 2016, which speaks to some of the other comments (about gold coins being beyond the financial means of many collectors)….I’m looking forward to that one. Also, I know many collectors are very happy buying third party graded modern coins, but so many other collectors believe paying a premium for graded modern coins (or to have them graded) is a questionable use of funds. Is this really necessary for modern coins that come straight from the mint in capsules? Meaning, we put our faith in some coin wizard at NGC or PCGS to tell us a brand new coin from the mint is either MS-69 or MS-70. We all know that a coin can be graded one way by one person and another by someone else, and either way on any given day (i.e., MS-69 or MS-70). One would think that by now, someone would have interviewed a professional grader and bluntly asked, “why did you designate X coin as MS-69 and not MS-70?”. I’ve yet to see any such interview. Final comment/question. What coin are you referring to (and why) when you say, “And thank heavens the U.S. Mint missed the sesquicentennial of that coin in 2014”? Thank you so much for your comment, Brian, which enriches the discussion! Apparently, concerning the mint marks, the production would have had to be coordinated at all three mints and that would have increased costs and oversight. I had considered the mint mark to be a design device and not a real indication of where the coin was minted, but that ran against regulations (and would have caused confusion). In the end, I was thinking about the collectors out there wishing they could own one of those ultra-rare specimens, like the 1916-D Dime. I don’t know if the final products will carry any mint mark and where it will be placed. Regarding the $100 American Liberty High Relief coin, I meant the absence of devices that clutter the planchet and detract from Lady Liberty. A clean field is hard to find in some commemoratives, especially the quarter series. The planchet is small and often littered with artwork. A perfect example is the 2013 Mount Rushmore Memorial Quarter with a miniscule sculptor hanging off a cheek and another worker on a tiny scaffolding. Yes, there is a debate about grading typical MS69 and MS70 modern coins. The surface is looked at with a microscopic view for any flaws not necessarily seen with the naked eye.If people are willing to pay for MS70, alas, there always will be that market. As for my snarky comment–“And thank heavens the US Mint missed the sesquicentennial of that coin in 2014”–I meant that as a dig. The Mint is in the habit of commemorating coins of the past (i.e. the Kennedy half dollar, the Walking Liberty half dollar, the Standing Liberty quarter, the Winged Liberty dime, the Indian Head nickel, etc.) So I played off the pun–“My two cents.” The two-cent coin first appeared in 1864. Well at least they are going back to more beautiful historic designs. I find the 2015 high relief coin was dismal lately its all olive branches and no arrows in design. 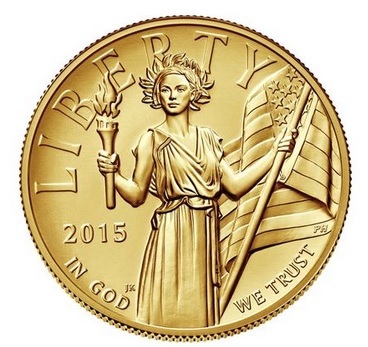 They should have done something after the gold liberty coin but what’s done is done. I think the mint should be issuing Gold Buffalo in fractionals or some type of coin in pure .9999 gold in fractionals. Heaven forbid we should have kilo coins 5, 10 ounce eagle coins and not with a 25 cent face value. Heaven forbid we should be innovative again. It’s ridiculous and would be good for business and bring more collectors in. I think the gold is elegant and “clean” but I’m not buying anymore $5 commems right now. Then again it could be worse, if the mint were to produce all these mickey mouse and superman coins (and the like) as other mints are doing). I agree the 2013 Rushmore quarter is a bit crowded. 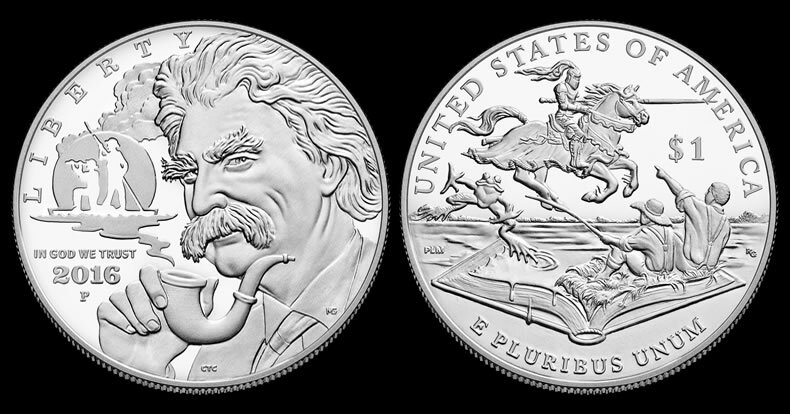 I personally didn’t mind it as much as some other coins (e.g., the new Twain $1 Silver), it actually reminded me a little of the 1986 liberty $5 gold commem, with the close-up of the sculpture. @TheAmerican – interesting comment. I actually liked the absence of arrows for a change. Haven’t we been-there-done-that? And by the way, the eagles in the standing liberty quarter and walking liberty half dollar don’t carry either arrows or olive branches. You call it a dismal design because it has no arrows, for real? The design is one of the best I’ve ever seen out of the US Mint, and I wish they would actually coin it for circulation. I’m sick and tired of these super long run designs with Washington, Lincoln, Jefferson, and Lincoln. It is time for a change already! The 2015 gold oz is beautiful! My one grievance with it is that it has $100 on it as the denomination. My rational is that it reinforces a historically inaccurate ratio of silver to gold. Meaning for instance in 1914, and many years before and after, you could exchange 20 silver dollars (roughly an oz of silver each) for a $20 double eagle (almost an oz of gold) an exchange rate of 20:1 and in more modern examples they have used $50 denomination on the Buffalos and the AGE and kept the ASE as $1 a 50:1 ratio. Now the $100 gold coin while they still keep the ASE as $1 a 100:1 ratio. I know it’s an ASE and those have always been $1 but could we not make it a $5 and keep with the 20:1 ratio? I would love to hear your thoughts on the subject! Some may make the argument that there are factors behind the scene that are intentional in guiding the disconnect in the silver to gold ratio. Re mint marks: How hard could it be to “coordinate production” at three mints? The 1984 Olympic $10 gold was struck at *four* mints without a problem.